I’Mpossible – Desire. Dream. Do. Have you ever felt like giving up? Have their methods to motivate fallen short of expectations if not flat on their face? Jeff believes your future is only as bright as your vision. For example, do you think ‘it can be done’ or do you think ‘it can’t be done’? Do you believe enough to take the first step forward and break free from the chains of the unseen enemy of doubt and fear? Jeff will walk you through a few of the tried and tested truths, he’s discovered and written in his award-winning book I’Mpossible; Desire. Dream. Do. 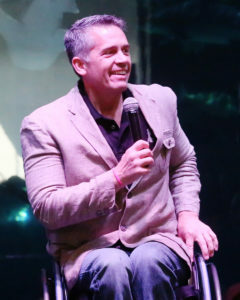 He will get up out of his wheelchair and take a few steps forward to show you the impossible really is possible, even after the doctors gave him a ‘life sentence’ from a wheelchair and told him he would never move his legs or ever stand again. Jeff’s speaking style, humor, and message will spark the eternal tinder inside you and ignite the seeds of success you’ve already sown. His transformational message and life-altering experience will assist you to see a little clearer and believe a little brighter. As an ordinary man living life from a wheelchair, Jeff has accomplished some extraordinary things. He played in the 2004 Paralympic games in Athens Greece and competed in Amsterdam, Holland, as a silver medalist for the USA men’s wheelchair basketball team. Jeff played in the National Wheelchair Basketball Association (NWBA) as a National Champion, and was a 4-time All-Star MVP. He was the #1 men’s wheelchair tennis player in the State of Utah and won the St. George Marathon. Jeff also has two Guinness Book of World Records and an award-winning book titled I’Mpossible: Desire. Dream. Do. He has a Master’s degree and created a worldwide peer-to-peer leadership program, which was recognised at the United Nations. In his spare time, Jeff enjoys spending time with his beautiful family, mentoring youth, eating pizza, playing games, and exercising. He is passionate about progress and peanut butter M&Ms. When it’s all said and done, Jeff hopes to amplify the power and potential in millions with his transformational message and life-altering experience.